You must congratulate Mr. Rubin on putting out revolutionary releases of Android, and ahead-of-its-time hardware like the Samsung Galaxy S II, the Nexus 7 and 10 tablets. There is no question that Android Jelly Bean is the greatest mobile operating system of all time, turning the competition into helpless tweeters. Mr. Rubin truly deserves the Nobel price of mobile technology if there was one. So, readily conquering a 250 billion dollar market, why is someone else suddenly in charge of Android? The Business strategy for Android may not work out for Google going forward. Mr. Page perhaps has nightmares of a future where Android has a 90% market share equally split over Amazon, Samsung and no-name China, all gating Google from the mobile Internet despite running on Android. Google must continually secure its 97% market share in mobile advertising and the current way of controlling Android does not appear to be working going forward. Samsung is a special case in this. Neither Apple or Google have had much luck in isolating Samsung from the market which would be a requirement for the previous state of affairs to continue. The attractive technologies provided by Samsung has made it the dominant supplier which is a surefire way to enable your supplier to break out of the confines of your ecosystem. Samsung and Google are still best friends forever, but Google has Motorola and Samsung develops its own app store and operating system. The asset everybody needs is what is not open source: some utility software and 1 million apps in the Google Play store. There is another inevitable evolution that Mr. Rubin's internal Google rivalry blocked: mobile development and cross-device capabilities are in need of a tenfold increase in developer productivity from where it is today, as well as getting unified across cars, tvs and watches. This evolution has been blocked for at least two years on Android that has suffered from the peculiar Android browser rather than the innards of Google Chrome managed by Mr. Pichai. The app layer on iOS and Android are based on 15 year old technologies that today are ridiculously primitive internally. Meanwhile, Chrome OS has been a technology in search of customers. Web-OS attempted a modernized integration in 2009 but was shut down by HP management. Forcing the issue, today's Firefox OS and Samsung's Tizen makes Google act. This change brings revolutionary needs for new approaches to charging customers, managing app stores and enforcing security. There's much more to say about hardware, Nexus, Motorola and other ambitions of Google. However, the essence is that yet another Google executive will be receiving a paycheck so immense that he can never leave. 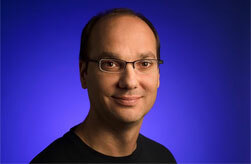 Fact remains, Andy Rubin brought us Android Jelly Bean.